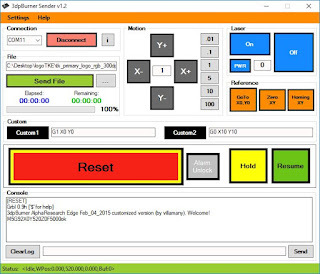 A maintenance release of the 3dpBurner Sender application. -Added "Send configuration file to 3dpBurner" option. Check "Settings" menu. No more manual line by line GRBL configuration. -Added "View 3dpBurner configuration" option for retrieving the actual 3dpBurner parameters. Check "Settings" menu. -Added button for direct moving the carriage to X0,Y0 coordinate. -Moved the "Unlock Alarm" button next to the "Reset" one and added blinking button warning when locked. You can directly download de Windows binary here. Or the source code here.